06-Jul-2011 -- This is the 16th out of 20 confluences that I reached on my bicycle trip along the Great Wall of China. The story starts at 41°N 115°E. The previous report is 38°N 109°E. At 5:00 AM in the morning I got up and hit the road at 5:45 AM. The town I had stayed the night is called Wúqí (吴旗县), which is only 20 km from the confluence as the crows fly. However, the road follows a deep and curvy valley which triples the actual travel distance. The area is full of oil pumps. Although the drilling for oil is quite an impact for the landscape and nature, the advantage is the existence of a good infrastructure and a dense network of roads (note that the oil pumps are scattered all over the place and need road connection). At a distance of 7 km remaining I left the main road and entered a side valley. A narrow asphalt road brought me as close as 1.05 km from the confluence. At a nearby farm I asked the farmer family whether I could leave my bicycle at their house for a while. My whish was granted. Then I started a beautiful hike through a valley without a road (and without oil pumps!). I was already mentally and equipment-wise prepared for some steep climbs, but the confluence turned out to be located in the valley that I was already in. Only the last 10 m were bit of a climb. 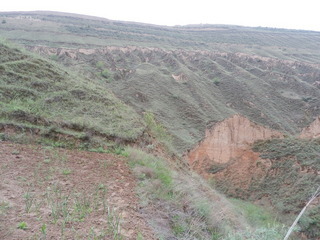 Standing at the confluence, it becomes clear that the mountains consist of Aeolian silt deposit (loess) and that erosion must be a severe problem. There is little other vegetation than grass, moss and lichen. Although there are no agricultural fields in the whole valley, there is a little onion plantation right at the confluence point. Back to my bike I got invited into the house by the farmer family. I declined, because I have become cautious when visiting confluence points. The problem is that I don’t have a plausible answer to the question what I was doing there. Suspicion can arise and escalate in a feedback-loop among local people. So I (sadly) declined and continued the bike trip 100 km further over a mountain pass to the town Dìngbiān (定边县) and stayed the night there. I should also mention that I got caught in a combination of a sand- and thunderstorm. Luckily a truck picked me up from the road and brought me to the next save place. Time starting the hike: 8:10 a.m.
Time at the CP: 8:39 a.m. Description of the CP: In Wúqí County near the border to Dìngbiān County in Northern Shǎnxī Province. In an area where oil exploitation is currently going on. Story continues at 38°N 107°E.